Might a unibody pickup truck from Volkswagen be on the cards? Quite possibly. 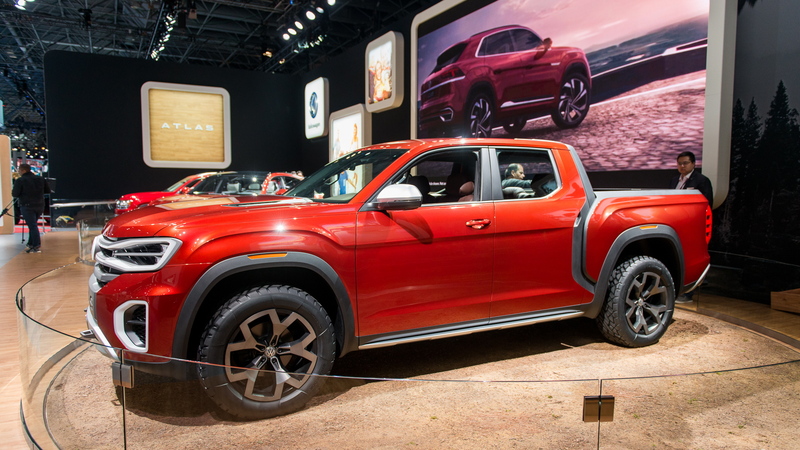 The German automaker on Wednesday unveiled the Atlas Tanoak concept at the 2018 New York auto show. 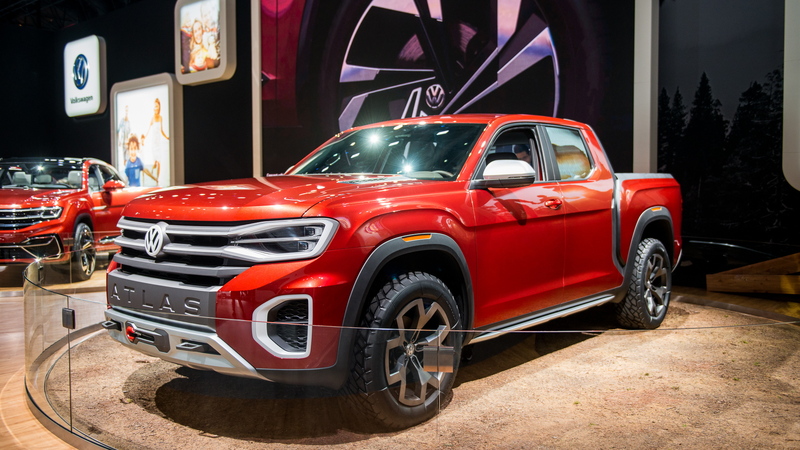 It's a mid-size pickup based on the Volkswagen Group's flexible MQB modular platform, and while there are no plans for a production version VW openly admits that it's keen to gauge the potential for one. Don't think it can't happen. Hyundai showed its own pickup concept two years ago, and a production version was recently confirmed for launch at the end of the decade. 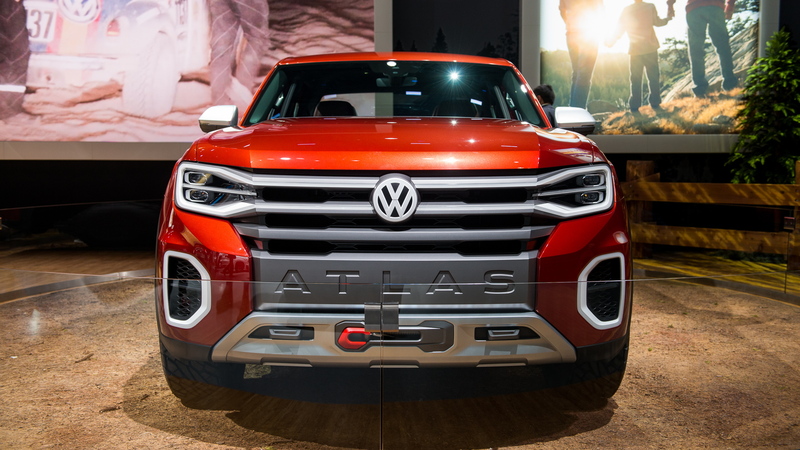 The Atlas Tanoak is closely related to the three-row Atlas SUV, which is in production at VW's plant in Chattanooga, Tennessee. With a local production site already established, VW would be able to escape the costly chicken tax that prevents foreign-made trucks from being sold here. In fact, the tax is the main reason we don't get VW's Amarok pickup truck here. But the Amarok is based on a body-on-frame platform. In contrast, the Atlas Tanoak is a more car-like unibody design. 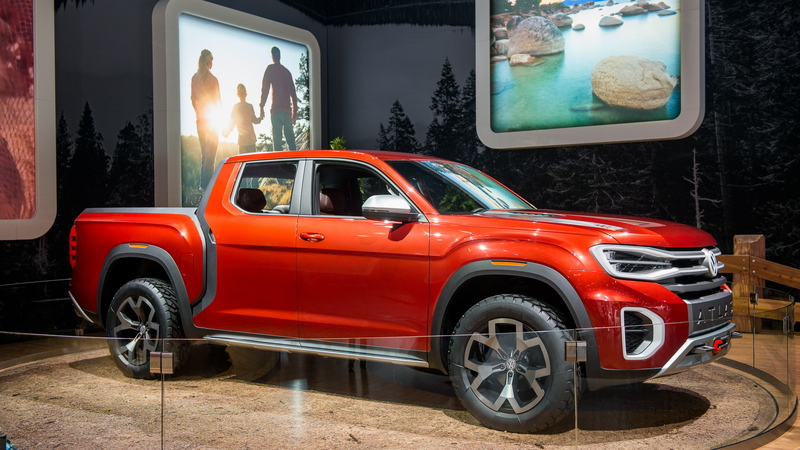 It means if the production green light is given, the VW truck would be a direct rival to the Honda Ridgeline, which is based on the same unibody platform of the Honda Pilot. Honda sold about 35,000 Ridgelines last year. The Atlas Tanoak, named after an oak tree common to the Californian coastline, features a dual-cab, short-bed design. It measures 214.1 inches in length, making it roughly 3.0 inches longer than the recently revealed Ford Ranger and almost 16 inches longer than the Atlas, so it's definitely big for a mid-size truck. A unique feature of the concept is a rail that is mounted on the pickup bed. Normally, the rail is fixed by the back of the cab, but on the Atlas Tanoak it can slide the length of the bed and thus doubles as a carrier for things like canoes and ladders. Very handy. Power comes from the familiar 3.6-liter V-6 fitted to the Atlas. The narrow unit is good for 276 horsepower and 266 pound-feet of torque, and in the Atlas Tanoak it's hooked up with an 8-speed auto and all-wheel drive. VW says the 0-60 mph sprint takes 8.5 seconds. Inside, you'll find all the latest VW goodies like a 12.3-inch screen serving as the instrument cluster, as well as a 10.1-inch touchscreen with proximity sensors and gesture control serving as the infotainment hub. The concept also features sporty, contoured seats for all five passengers. Foreign automakers have failed to make inroads into pickup segment in the United States due to the dominance of the domestics, but given the strong consumer shift to SUVs and pickups a vehicle like the Atlas Tanoak might still be a good idea. We'll have to wait and see. VW also used the N.Y. auto show to present the Atlas Cross Sport concept. 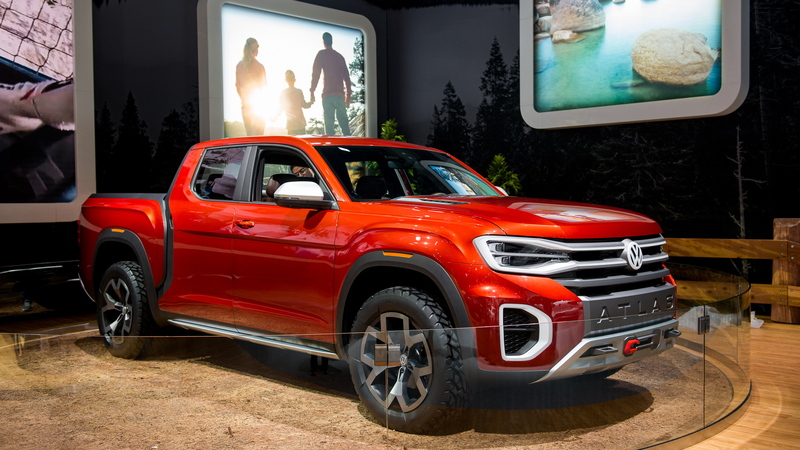 It's a smaller, more rakish version of the Atlas that is heading to production in 2019, also at the Chattanooga plant. To learn about other vehicles appearing at the show, head to our dedicated hub.